We hope that you all have a wonderful Thanksgiving with your Family and Friends! Have a safe weekend and enjoy the weekend. Thanksgiving Day is almost here! This is my favorite time of the year with all of the leaves off of the trees and Thanksgiving right around the corner. This very special day has always started with the Macy's Thanksgiving Day Parade with all of the Floats, High Flying Balloons, Marching Bands and of course Santa! What would Thanksgiving be without Football, Family, Friends and most of all great food. Do you even know why we celebrate Thanksgiving? Some of us were taught this in school and some think it's just to enjoy Turkey and take a nap! We can trace this historic American Christian tradition to the year 1623. After the harvest crops were gathered in November 1623, Governor William Bradford of the 1620 Pilgrim Colony, “Plymouth Plantation” in Plymouth, Massachusetts proclaimed: "All ye Pilgrims with your wives and little ones, do gather at the Meeting House, on the hill… there to listen to the pastor, and render Thanksgiving to the Almighty God for all His blessings." 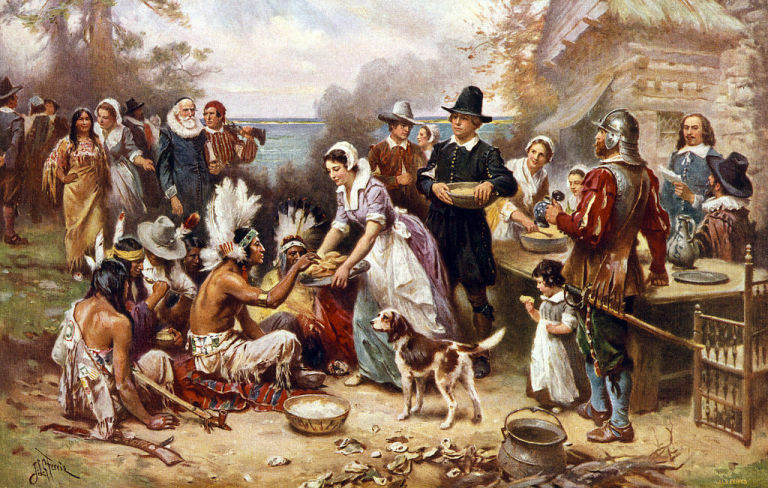 As Bradford noted, the pilgrims of Plymouth enjoyed an especially good harvest that fall, so they planned a meal to celebrate and give thanks for the abundance of food. The local Wampanoag natives had worked along with the pilgrims to hunt, fish, and gather the food, so they all joined together for this dinner to give thanks for it all (and yes, there was turkey!). This peaceful dinner between natives and settlers may seem a bit dubious to some, given the tensions between the two groups, but it's exactly that concept of two cultures coming together that made the dinner so memorable and important to our country's history. In that same spirit of joining together to give thanks, the tradition of "thanksgiving" continued in the U.S. While your enjoying this Thanksgiving, we hope that Family, Football and Friends are a part of your Celebration.